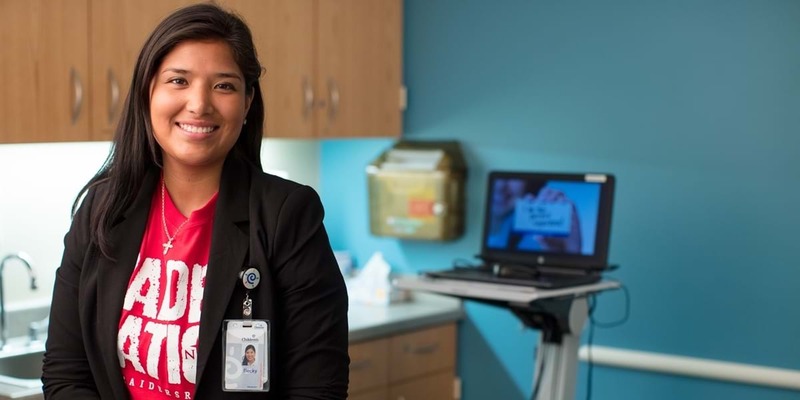 Rebeca says helping people receive the medical care they need is one of the most rewarding aspects of her career. Bilingual in Spanish and English, she originally considered majoring in first business and then exercise science before she combined her translation and interpretation major with a minor in health. What kind of education did you receive at Northwestern? My professors were invested in my learning. They were always working hard to help me succeed. Northwestern’s different multicultural clubs helped me build strong friendships and learn from different perspectives. And the variety of classes that were part of the college’s core requirements helped broaden my horizons so I became a well-rounded individual. Having small classes was very helpful since we were able to learn from other classmates, acquire experience, and obtain more one-on-one feedback from our professors. We had a lot of opportunities to practice in real-life situations via volunteer activities and integrated educational opportunities with other future professionals, such as nurses and social workers. What is Piet Koene like as a professor? Professor Koene is a certified interpreter/translator in both healthcare and court systems. He works really hard to expose our class to a variety of topics and an array of vocabulary to improve our interpretation skills. The same is true with translation. We covered different translation topics, such as politics, culture, business and healthcare, to be excellent translators in a variety of settings. During my time at Northwestern, I was blessed to do my internship at Children’s Hospital. That internship opened the door for me to get a full-time position after I graduated and provided an opportunity for a smooth transition from college to my career.